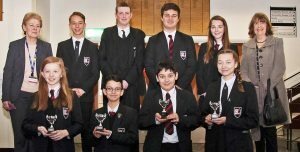 OUTSTANDING pupils at Winston Churchill School took a bow after being named winners of the Owen Davis Awards. The awards are in memory of Owen, a former pupil at the school who died of epilepsy at the age of 14. His family set up the awards in his memory to acknowledge students who show courage and determination in overcoming or coping with adversity, who make a tremendous and consistent effort with their studies, or are exceptionally helpful and positive members of the school. The Annual Award Winner was Philip Potter, aged 17 of Woking. After suffering with an undiagnosed peritonitis over the Christmas period Philip had to miss an entire half-term of school. In spite of this he went on to do extremely well in his GCSEs, showing great determination to succeed. Chloe Richardson, aged 13 of Knaphill, a young carer taking care of her mum on a daily basis, while managing to work extremely hard at school and very proactive in helping out. Poppy Raynes, aged 14 of Knaphill, who has spent lots of time this year fundraising for her mum while remaining a high-achieving and positive student. Olly Edwardes, aged 15 of Knaphill, an excellent role model and ambassador for the school. Jamie Harding, aged 16 of Kingfield, always polite and courteous and coping extremely well with school life in spite of experiencing debilitating migraines. Constantine Moschouris, aged 11 of Woking, for his positive and helpful attitude, an excellent example of the school motto “Service Before Self”. Sam Betson, aged 14 of Woking, a kind hearted young man who has remained strong despite the impact of a serious family illness. Usman Hussain, aged 12 of Woking, an inspiration with his determination and resilience in the face of a serious medical condition. Caitlin Carter, aged 15 of Woking, who suffers from hypermobility but demonstrates a fantastic attitude, overcoming obstacles in spite of setbacks.